Each adjustable element within the recessed luminaires has a 365° horizontal rotation and 180° vertical aiming while providing a continuously adjustable beam angle from 15° and 45° with its rotatable front face. The element accommodates one lens from a collection of colored and frosted flat lenses, spread, and beam elongating versions, as well as one glare control accessory from an array of louvers and snoots. The recessed multiple spots are available in IC or non-IC rated styles. Four color temperatures are offered, including 2700K, 3000K, 3500K and 4000K, all with a high 90 CRI. The luminaires deliver a 3605 CBCP and up to 4740 lumens with the four-light model. A Universal (120V-277V) driver with ELV, TRIAC or 0-10V Dimmer dims down beautifully to five percent. 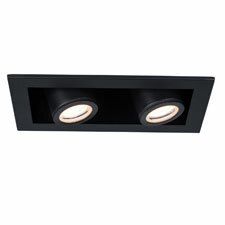 All of the LED luminaires in this series are offered in White or Black interiors, with White trim. Trimless models are also available. Fueled by a passion for creating, WAC is a second generation family owned and operated lighting company with a reputation for quality spanning over 35 years. With a history of inventing and looking at things from a fresh perspective to make technology leveraged products widely accessible, WAC Lighting believes that a key part of being a Responsible Lighting company is to provide a product offering that is progressive in both design and technology. Groundbreaking innovations in LEDs, materials engineering and creative optical design are paving the way for endless possibilities. With over 100 engineers on staff across four factories in the US and China, WAC puts creative and forward thinking minds behind solving the most challenging lighting needs with lighting technologies. All designs are thoroughly tested in the company’s internationally recognized NVLAP, UL and ETL certified testing laboratories for safety, durability and robust long-term performance far beyond required standards.